First step in marathon recovery that you will want to take is once you cross that finish line is to see if you have any swelling - in your ankles, legs, feet, knees, etc. Your body can not properly heel if you do have swelling and the faster you get it under control the faster you will recover. Some runners will not experience any swelling but if you do follow the RICE principle: Rest, Ice, Compression, Elevation. If you do not have any swelling the next important thing in marathon recovery is to reduce any inflammation. This can be done by: taking NSAIDS such as ibuprofen, taking an ice bath, eating lots of fruit and vegetables, and drinking lots of water! Take advantage of the massage tent. The times that I have gotten a massage immediately following a race I have recovered (in terms of muscle soreness) so much faster! Plus it feels ah-maz-ing. Your "masseuse" will also probably give you some further insight on whether your joints are reaching their full range of motion, if you are imbalanced, if you are very tight in certain areas, etc. and will then give you some stretches that you can do to make that feel better and work it through. Stretch it out! Even if you do go and get a massage. Open up your hips, stretch your inner thighs, and keep your legs straight. They have been kept tight and have been undergoing a repetitive movement for 26 miles. The more resistant they are to stretching the greater their need to be stretched (unless of course, in the case of an injury). You lose a lot of flexibility as a runner and even more so from running a marathon. Try to work in at least 20 minutes of stretching on the day you finish your marathon. Keep stretching for 20 minutes per day for the next week. ---- A good stretch to try and one that doesn't require too much effort: Lie on the floor, scoot your bum to the wall, and rest your legs up on the wall. This will to reduce any swelling that might want to occur. It also makes for a good, easy stretch after the marathon. Hold this position for about 10 minutes. Maybe you can shut your eyes and take a nap. Wear your compression socks for 48 hours after your marathon. It has been proven that they help functional recovery. Keep your marathon recovery diet at 55-60% carbohydrate so that you can start to replenish those depleted glycogen stores. Choose foods that are higher in glucose like, pastas, breads, and rice. Try to also eat at least 20% protein to help the muscles begin repairs and recover faster. If you have any chafing, rub some Vaseline or Body Glide on the affected area. Drinking lots of water and stretching will also help to reduce muscle soreness. Have that salty margarita. It will replenish your sodium levels lost through sweating. Also, a beer or two wont hurt. You may experience tightness especially the first night post marathon. Try to use your foam roller to loosen up those muscles at least once throughout that first day. It would be best to foam roll right before bed as loosening the muscles will cause them to relax and you will be more able to fall asleep faster, have a greater quality of sleep and will find your sleeping position more comfortable. If you experience "charlie horses" (more common at night) following the marathon where your calf muscles lock up on you and can cause you to cry like a baby, just concentrate on pulling your toes up and lengthening your calf muscle. The charlie horse will disappear almost immediately! Take at least 500-1000 Vitamin C. Your immunity level will be compromised from running such a long distance. You are prone to developing a cold, fever, or sickness right after running a marathon due to this. So be preventive. Stretch for at least 20 minutes each day. You can do some light exercises such as walking or light cycling or maybe a slow jog but not intense, fast paced running. Remember to wear your compression socks for 48 hours post marathon to get the full recovery benefits from wearing them. If you are starting to feel "run down" (excuse the pun) keep taking your Vitamin C.
Give your brain a break - it also needs some marathon recovery time, ok? You just asked it to completely use all its energy to go a crazy long distance. Don't be doing crossword puzzles and heavy reading. The best thing you can do for it is actually to go to sleep, let it rest, rewire, work through all that you just put it through. When can you run again? When is you Marathon Recovery Cycle Complete? I like to give runners at least 1 day of rest/1 mile of the race. 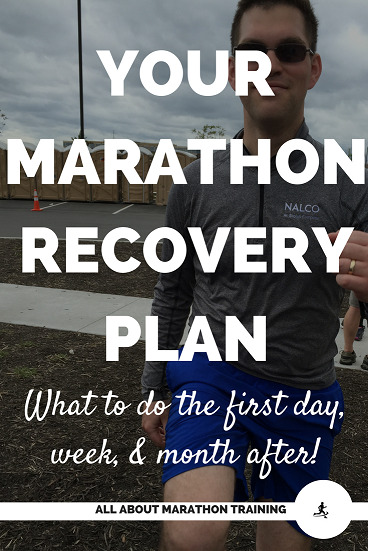 So if you run a marathon, take a break from all racing, speed working, and hill training for about 26 days and consider this your marathon recovery period. You can run but keep it to slow, easy runs at about 60% of your heart rate. Running too an intensely, too soon after a marathon will put you at a high risk of injury. After 26 days, you can start another training program (assuming that you are now a die-hard marathon fan). Ease into it though. Don't start training at the fitness level you were at when you ran a marathon. Give your body time to get back into a training routine and start off slowly and gradually. 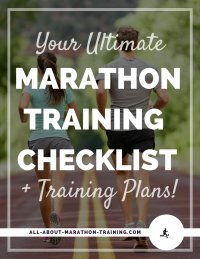 If you aren't ready to start training for another race but don't want to lose all of your hard earned fitness then here is a plan of action! How to Stay in Shape in Between Races & Training Cycles: A Plan of Action! "Foods That Fight Inflammation - Harvard Health." Harvard Health. N.p., July 2014. Web. 01 Apr. 2016.